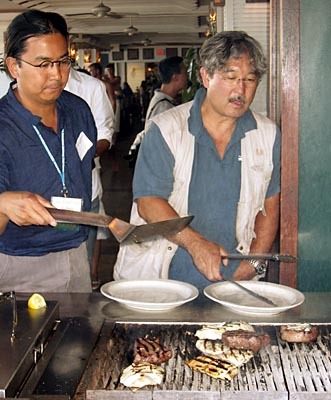 Photo Ops, Cooking Stops and Misc. 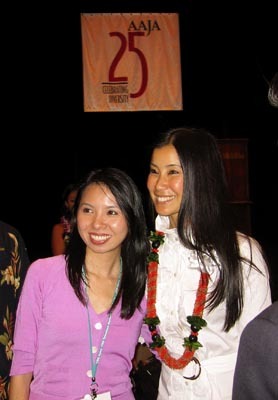 Our keynote speaker Lisa Ling, right, poses for a photo with a journalist during our luncheon. Seems like everyone wanted a photo with her. 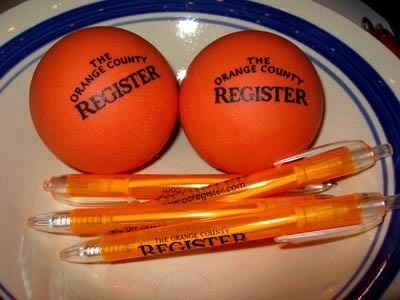 Some of the schwag from the career fair from Brian’s paper. People were grabbing up all kinds of stuff. Always one for a feature photo Dennis spies a wedding party and can’t resist getting some photos but the groom roped him into taking a group photo with a little digital camera. Dinner was at the Shore Bird Restaurant and as Bill Murray’s character in Lost in Translation would say, “what kind of place makes you cook your own food?” You load up at the salad bar that has everything except the meat which the waiter brings raw to the table. WTF? Here photogs cook their dinner. Richard and Michael play the part of cooks, you know, in case that photography thing doesn’t work out. I got it easy, one of those pieces of fish is mine that they’re cooking. 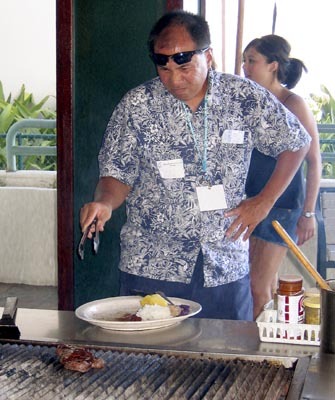 Tony seems a bit disgusted that he has to cook his own food. And how much do you have to tip when you have to get up, go get your plates to a buffet and cook your own food? 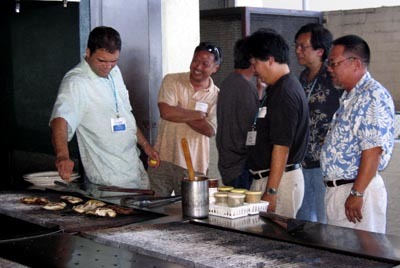 Here’s a spatula-cam view of me cooking my ono (fish) on the grill. 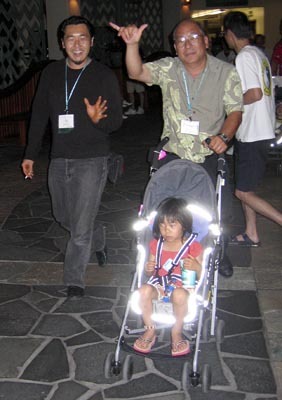 Dai and Paul have stroller duty heading back to the hotel. 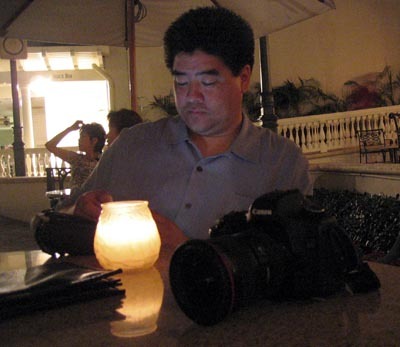 Eugene relaxing by candlelight at the Moana while he have a few drinks. I tried to order a Mojito but the waiter chickened-out and said they didn’t have the ingredients. I may have to attend our convention next year in Miami to get a proper mojito.